This is a list of Bohemian monarchs now also referred to as list of Czech monarchs who ruled as Dukes and Kings of Bohemia. The Duchy of Bohemia was established in 870 and raised to the Kingdom of Bohemia in 1212. 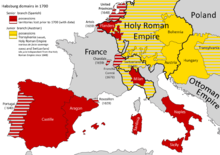 From 1004 to 1806, Bohemia was part of the Holy Roman Empire, and its ruler was an elector. During 1526–1804 the Kingdom of Bohemia, together with the other lands of the Bohemian Crown, had been ruled under a personal union as part of the Habsburg Monarchy. 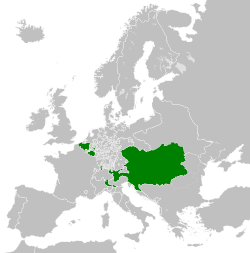 From 1804 to 1918, Bohemia had been part of the Empire of Austria, which itself had been part of the dual monarchy of Austria-Hungary from 1867 to 1918. Following the dissolution of the monarchy, the Bohemian lands, now also referred to as Czech lands, became part of Czechoslovakia, and form today's Czech Republic (Czechia) since 1993. The Austro-Hungarian Compromise of 1867 established the dual monarchy of Austria-Hungary. 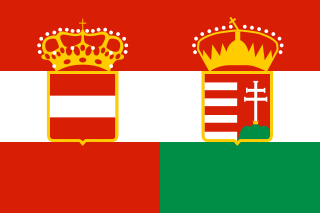 The Compromise partially re-established the sovereignty of the Kingdom of Hungary, separate from, and no longer subject to the Austrian Empire. The agreement also restored the old historic constitution of the Kingdom of Hungary. Cisleithania was a common yet unofficial denotation of the northern and western part of Austria-Hungary, the Dual Monarchy created in the Compromise of 1867—as distinguished from Transleithania, i.e. the Hungarian Lands of the Crown of Saint Stephen east of ("beyond") the Leitha River. The Imperial Council was the legislature of the Austrian Empire from 1861, and from 1867 the legislature of Cisleithania within Austria-Hungary. It was a bicameral body: the upper house was the House of Lords, and the lower house was the House of Deputies. To become law, bills had to be passed by both houses, signed by the government minister responsible, and then granted royal assent by the Emperor. After having been passed, laws were published in the Reichsgesetzblatt. In addition to the Imperial Council, the fifteen individual crown lands of Cisleithania had their own diets. The German phrase kaiserlich und königlich, typically abbreviated as k. u. k., k. und k., k. & k. in German, cs. és k. in Hungarian, c. a k. in Czech, C. i K. in Polish, c. in k. in Slovenian, c. i kr. in Bosnian and Croatian, and I.R. in Italian, refers to the Court of the Habsburgs in a broader historical perspective. Some modern authors restrict its use to the Dual Monarchy of Austria-Hungary from 1867 to 1918. During that period, it indicated that the Habsburg monarch reigned simultaneously as the Emperor of Austria and as the King of Hungary, while the two territories were joined in a real union. The acts of the common government, which only was responsible for the Imperial & Royal ("I&R") Ministry of Foreign Affairs, the I&R Ministry of War and the I&R Ministry of Finance, were carried out in the name of "His Imperial and Royal Majesty" and the central governmental bodies had their names prefixed with k. u. k.
Austrian Silesia, officially the Duchy of Upper and Lower Silesia, was an autonomous region of the Kingdom of Bohemia and the Habsburg Monarchy. It is largely coterminous with the present-day region of Czech Silesia and was, historically, part of the larger Silesia region. The Austrian Circle was an Imperial Circle of the Holy Roman Empire. It was one of the four Imperial Circles created by decree after the 1512 Diet at Cologne, twelve years after the original six Circles were established in the course of the Imperial Reform. It roughly corresponds to present-day Austria, Slovenia and the Trentino-Alto Adige/Südtirol region of Northern Italy, but also comprised the Further Austrian territories in the former Swabian stem duchy. 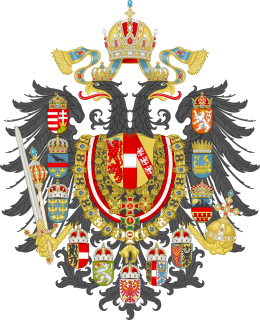 The Duchy of Salzburg was a Cisleithanian crown land of the Austrian Empire and Austria-Hungary from 1849–1918. Its capital was Salzburg, while other towns in the duchy included Zell am See and Gastein.